A small flint church, rebuilt in 1749-50 on the site of a mediaval one, to which a north aisle was added in 1868. The church, like St Bartholomew, was destroyed in the siege of 1642 and nothing is known about its former appearance, save that it had a tower that was used then as a gun platform (Green p51). However, the parish remained in existence without a church and in 1685 the site was in use as a timber-yard (1 p263). Only in 1749-50 was a new church constructed, designed by the Duke of Richmond’s surveyor, W Ride (Colvin 4th ed p869). The Duke was one of those subscribing to the rebuilding and the cost was apparently £804 11s 2d (Green p51), though according to Dallaway it came to over £1000 (I p192). The church is built of beautifully knapped and squared flint with stone dressings and rather approximate gothic detail, as the attempt at panelled tracery in the two south windows shows. 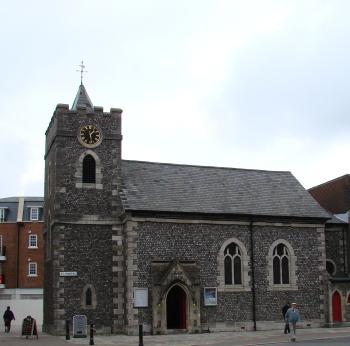 As so often in Chichester, the site is small, so the chancel is short and has only circular side-windows, since the east wall abuts onto other buildings. The tower, almost as broad as the nave, is oblong in plan, with plain pointed openings and battlements and a tiny pyramid spire. The entrance to the church was originally here. 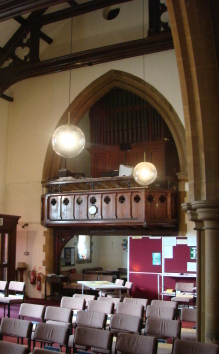 The interior of Ride’s church had a plain plastered chancel arch (B 27 p354), centred on a large pulpit against the north wall. It became too small despite the addition of a gallery in the tower in 1806 (Green p52), and in 1868 G M Hills remodelled it (ibid), so there is little earlier work to see internally. Hills added a broad north aisle, the only direction in which the church could be enlarged, making the plan of nave and aisle almost square. His detail, including the arcade, is late C13 in style and so is the new chancel arch, which has marble shafts; the tower arch contains a small organ-gallery. Of his roofs, the nave one is oddly retrograde, with tracery and cusping that recall the 1830s. Surprisingly, he barely changed the south side, inserting only a new main doorway and a trefoil-headed lancet in the lower stage of the tower in place of a round window that is shown on Adelaide Tracy’s drawing of 1852 (I p68). This also seems to show the south windows with higher sills, but there is no sign of alteration and had Hills done anything, he would surely have changed the tracery. 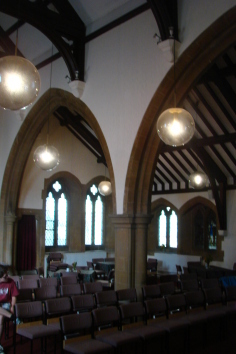 In 1987 the east end of the church was re-ordered and a small extension added off the aisle. 1. (Heads of south nave windows) C18 heraldic glass, including the arms of the Duke of Richmond and the Countess of Derby, who was the most generous contributor to the rebuilding, by —- Tremaine (BE p171). 2. (North aisle, first window) Jones and Willis, 1924 (WSRO Fac 3582). Reredos: Wooden of 1900. It displays the Commandments etc, a conservative feature by this date.